Todd Ford (visit his website and blog) is an American artist painting photorealistic still life with conventional subjects — but arranging them in exotic and highly saturated compositions. 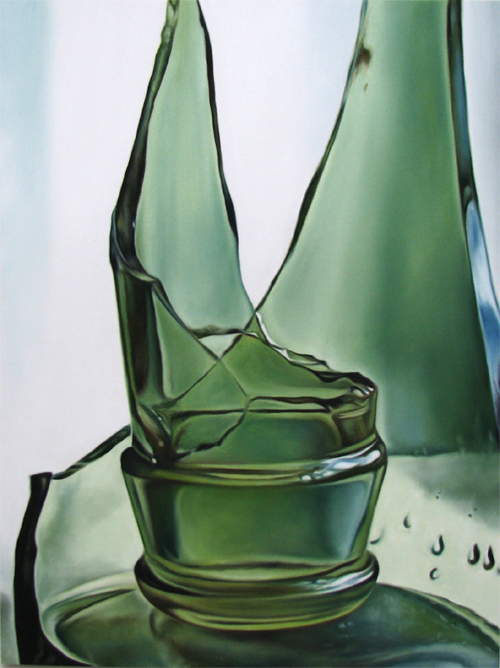 And at times that means disfiguring or even destroying the depicted item; such is the case with his series of broken bottles paintings. The sharp naked edges of the glass literally cut into and slice the space around them, as if taking a blind revenge on their implicit host. The necks, upside-down or turning away from the viewer, as if desecrated, appear as trophies of destruction itself. 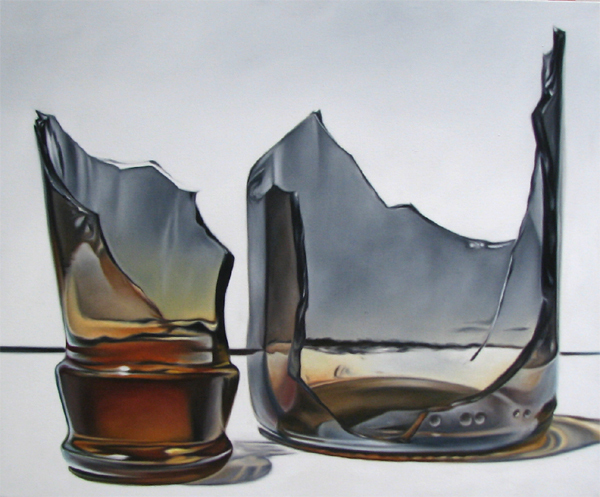 Yet, the round softness of the intact glass necks and bottoms counterpoises the irregularity of the broken angular lines, implying a literal synthesis: all the pieces, sharp and round, are made of glass. The random and chaotic linear movement reminds me of Linda Hardy’s plastic wrappers: both posit a threat of disruptive force and both originate from man-made, translucent materials. I think that Todd’s take on the complex theme of conciliating chaos with order similarly places his work on the cutting edge (pun intended) of contemporary still life painting. 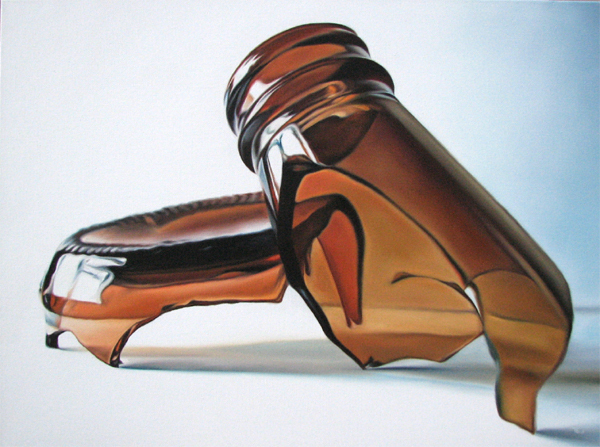 This series may stand for the problematics of human condition in modern era, the notion of the bottle serving as the epicenter of such issues as mass production and pollution. The tranquil palette and the photorealist style as the delivery method denote the artist as an objective reporter, ensuring an eerie impact of cool detachment — urging the viewer to take a stand. Indeed, photorealism emerges as the most suitable style for symbolic subjects where the symbolized needs less stylization and more representation. Just imagine any of these paintings in an impressionistic reincarnation — absurd, and a painterly misnomer. I think that the popularity of photo and hyper-realism discloses the wish to contemplate reality at its most pronounced while retaining an honest aesthetic and artistic framework. Additionally, this trend offers an adequate response to television and photography; it acknowledges their influence, yet assimilates rather than imitates. On the one hand, it proves that it can do “just as good,” and on the other keeps on renovating painting by continuous exchange of ideas with other art forms. To return to more technical aspects of Todd’s art, I would like to mention the scrupulous and incredibly (credibly, that is) accurate treatment and distribution of color. The brown flirts with black, red, gray and white, and its own range is exceptionally wide, the additional colors either deepening or diluting the original hue. The ensuing variety, backed by the irregular configuration, provides an unlimited source of entertainment. The green bottle piece displays similar qualities, with cooler tones. Putting all symbolism aside, these paintings are first and foremost technical masterpieces — and should be known as such above all.